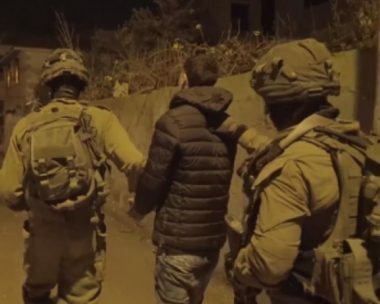 The Palestinian Prisoners’ Society (PPS) has reported that Israeli soldiers abducted, overnight until dawn hours Tuesday, 22 Palestinian, including a woman and two of her children in addition to a female university student, from their homes in several parts of the occupied West Bank. The PPS said the soldiers conducted violent searches of homes, and interrogated many Palestinians before abducting 21, most of them children. Waseem ‘Obeid, 15. (Ibtisam’s son), Jerusalem. Sa’adi Wisam Rajabi, 12, Jerusalem. Mohammad Maher Ghazzawiya, 13, Jerusalem. Nader Mazen Moheisin, 17, Jerusalem. Yousef Mohammad Darwish, 15, Jerusalem. Wajeeh Haitham Khatib, 17, Jerusalem. Ola Marshoud (university student), Hebron. Furthermore, Israeli colonizers attacked a Palestinian farmer while plowing his land in Burin village, southwest of the northern West Bank city of Nablus. In related news, a group of extremist Israeli colonizers invaded, earlier on Monday morning, Palestinian agricultural lands in Masafer Yatta area, south of Hebron city, in the southern part of the occupied West Bank, and burnt nearly 30 Dunams.